In an origin marked by highly-mechanized production that often relies on the use of agri-chemicals, finding a specialty-grade Brazil that’s also certified organic coffee is not an easy task. We spent a couple of years looking for a new source that didn’t already have a wide presence in the U.S. specialty market, and in 2011 our friends at Bourbon Specialty Coffee introduced us to Fazenda Saquarema. The farm lies just an hour to the south of our relationship partners at Santo Antonio Estates and is one of the few certified organic producers in the Sul de Minas region. 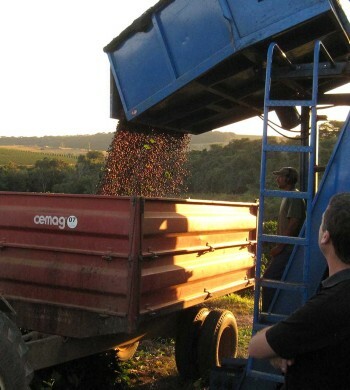 We have been pleased with the consistent quality of Saquarema’s coffee as well as the owner Luiz “Nam” Reis’ commitment to maintaining organic standards since the estate was first certified in 2001. At initial glance Saquarema resembles other farms in the area in that the coffee is fully exposed to the sun and not grown under shade, however Nam uses fertilizers and treatments made from organic materials to keep the tress healthy and productive.